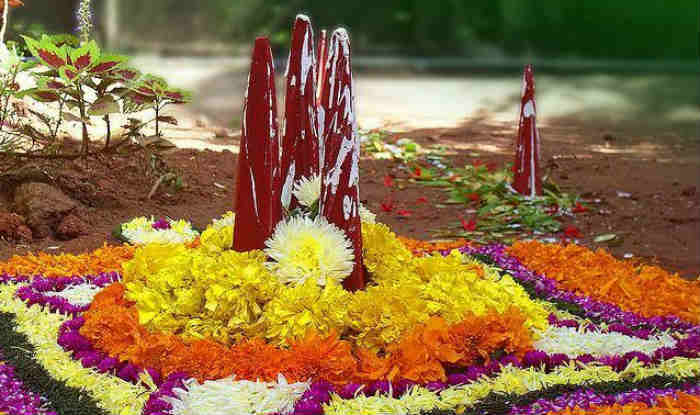 Onam, which breaks all man-made barriers of position, authority, caste, creed and religion, is the most popular festival in Kerala. King Mahabali giving everything he had including himself to Vamana is the core theme associated with Onam festival. King Bali is the epitome of Bhakti and self-sacrifice. One of the greatest tragedies our age is avarice – there is no giving or sharing. A vast majority of problems the world currently faces can be solved if we develop the element of sharing. Possessiveness leads to fear, which causes anger, lack of the ability to judge whether or not something is good or suitable and finally complete destruction of the person. We see this happening around us. The term Bali itself means offering, sacrifice and dedication. The story of Bali and Vamana is meant for Kali Yuga. Our ancient teachers had narrated the legend of Bali and Vamana keeping in mind the characteristics of Kali Yuga. The easiest way to attain bliss on earth is through unwavering devotion (Bhakti) and through sharing – taking what is needed for our basic needs and sharing rest with other living beings. Now a question arises if I give or share what will happen to me and my family? Scriptures say - Half that I earn is meant for me and my family, quarter for saving for future and quarter for sharing with the needy. Happiness that we receive from materialistic things is momentary. But the happiness that we receive from sharing is everlasting. There is a wrong notion in Kali Yuga that by sharing or giving one loses wealth. But in reality sharing or giving only results in growth. King Bali by sharing achieved the eternal companionship of Srihari Vishnu and Goddess Lakshmi. This is the reason on Thiruonam day, Malayalis around the world welcome King Mahabali to their homes. It is believed that during Onam, King Bali (Maveli) comes to visit his subjects. Each house in Kerala decks up to welcome King Maveli, during whose reign there was no corruption and people lived happily. On the Tiruvonam day members of the family gather together, usually at the ancestral home, for Onasadya (traditional Onam feast) served on plantain leaves. The finest part of Onam is the Onasadya - all family members sitting together and having traditional food. The feeling of two or three generations sitting together eating sadya (food) served by mothers is beyond words. Wherever we are or whatever we have become in life, Onam is the time when each and every Malayali goes backs to his roots.